I was on a rafting/photography trip with Western River Expeditions, I thought the crew was very experienced, helpful when needed, the food was outstanding, and the sites we stopped to take pictures was great! 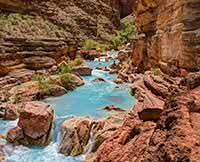 I especially liked the warm turquoise Little Colorado river to swim and enjoy! The views were breathtaking. I also liked the crew's extensive knowledge of the geology and people who rated the river. I am 69 years old and I was able to do this trip. Don't miss out on this great experience!